Before I became a mom, I had all these ideas about the kind of mother I would be and the kind of child I would raise. During my pregnancy, I dreamed about the instruments he’d play and all the sporting events we’d attend. I imagined him being on the honor roll and eventually going away to college. I wanted my child to have every opportunity I didn’t have and more. After Norrin was diagnosed with autism, I spent those first few months wondering what kind of life our son would have. I wondered if any of my dreams for him could ever be a reality. I’ve come to accept and understand Norrin’s autism. I know that he’s bright, I don’t need an honor roll to tell me that. I’ve learned that for us, it’s about goals not grades. I still wish so much for Norrin, I always will. And as Norrin gets older, I’m thinking about the life skills I want him to master. The more skills he has, the more independent he will be. Hygiene and Self-Care. Norrin is 9-years-old and I still assist with bathing and washing his hair. I still brush his teeth because he has difficulty. He understands he has to do these things he just has trouble doing them independently. Money Management. I’m not talking about stocks and bonds or balancing a checkbook. But I’d like Norrin to be able to go into a store and know how to pay for something. Initiate an Appropriate Conversation. Norrin does have language, however, much of his speech is scripted and extremely self-directed. Prepare a Meal. Whether it’s warming up chicken nuggets in the microwave, boiling some pasta with broccoli or making a peanut butter and jelly sandwich, I want Norrin to be able to prepare a meal for himself if he’s hungry. Learn to Take Public Transportation. Living in New York City, we always take public transportation. Norrin does really well on the bus and train. One day, I’d like him to be able to take the train or bus – even if it’s just one or two stops – on his own. Learn to use a Public Restroom alone. I still bring Norrin into the ladies room with me if my husband isn’t around. I would like him to be able to learn to navigate a public restroom alone safely. Safety Awareness. Norrin is a bit of a daredevil. I admire his fearlessness but it also makes me nervous. I want Norrin to understand how to cross a street, recognize when something is on fire or realize when he needs to stop and listen to instructions from first responders. Learn a Marketable Skill/Trade. Three years ago we moved Norrin from a regular public school environment to a smaller school specifically for children with special needs. I don’t know if Norrin will be able to receive a high school diploma or go on to college. But I hope he will be able to work. I believe in him and I know he can be a contributing member of society. Have a Friendship. Norrin doesn’t have many friends. Sure there are kids at school that he calls friends and there are some other kids he likes to play with. But as Norrin is getting older, friendships are getting harder. The kids that were okay playing with him two years ago are growing up and interested in different things. I just want Norrin to have one friend, one person in this world who gets him, the way I do. Learn to Swim. Norrin loves the water! He could spend every summer afternoon at the pool. I want him to be able to learn how to swim. I want him to have something he can feel proud of doing. And it’s a skill that could save his life. Ride a bike. We just bought Norrin his very first big kid bike. Over the last seven years we’ve gone through tricycles, big wheels and scooters. They’ve all been difficult for him to maneuver. He just didn’t have the coordination to pedal and navigate. But he’s been practicing at home and at school. And he’s doing so well! I could see the training wheels eventually coming off. These are the dreams I have for him. All I want for Norrin is to master the life skills that will make him independent and feel good about himself. That’s the best life skill of all. What life skills do you want your child to learn? This article was previously published on Parents.com and has been revised/updated for Atypical Familia. 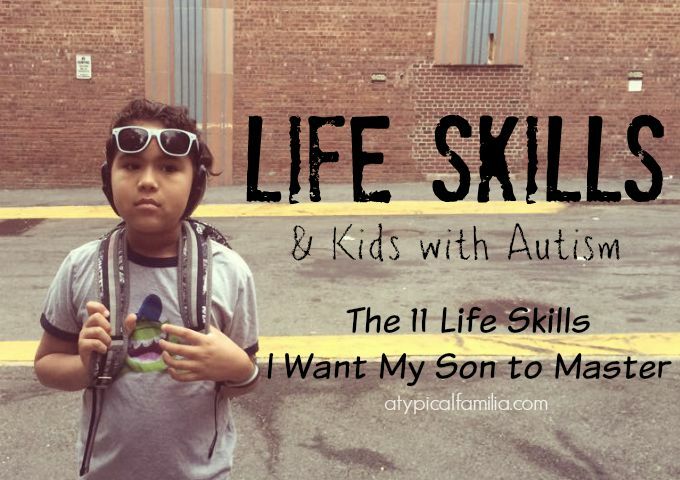 As I sit here and read the life goals for your son I am overcome with tears and emotions because I feel so alone in this life of being a mom to a special needs child. I have no one to relate to I feel like no one understands what I’m going thru because I am the only one with a special needs child. I just want for my 10 year old daughter to have a friend she can play with and not be alone all the time on the playground. She wants to befriend the kids at the park so bad but because she has only been talking since she was 7 the lack of language makes it hard to carry on a conversation past “Hi” or “what’s your name?” Chase and catch games have been a life saver for her to have at least some interaction with the other children because she doesn’t really need to speak for that game otherwise she’s alone on the playground. I have been wanting a mom’s support group or play dates with other children with special needs for the past 10 years with no avail. I have been told over the years I should start my own thing but have no clue where to start. My daughter also has been asking to go to dance school but I know that a regular dance school with typical children would not be a fit for her. Sorry to rant but to read about another parent who gets exactly how I feel just have me so emotional and I feel better typing this and blessed that I stumbled upon your blog from instagram. Also if you would like to follow my daughter has her own fashion/kiddie adventures in nyc instagram that I run, one of the things that give me joy as a parent of a child with special needs and a way I can bond with her thru dress up. I also just followed you on instagram. I would want my kid to have an eye for good and positive things in life. But that obviously requires support from both my side and the school’s side. Schools for special needs play a valuable role in developing basic skills in young kids and I would love it if my son could learn it all in a safe and encouraging environment.